Pollock-Krasner House and Study Center in East Hampton, New York - Get savings coupon! The former home and studio of abstract painters Jackson Pollock and Lee Krasner, a National Historic Landmark, preserves the environment that inspired them and contains evidence of their creative processes. Wearing padded slippers, visitors walk on the studio floor covered with the brilliant colors and rhythmic gestures found in Pollock’s masterpieces. On the studio walls, evidence of Krasner’s dynamic painting technique is visible. Open May-October for guided and self-guided tours, exhibitions, lectures and other public programs. 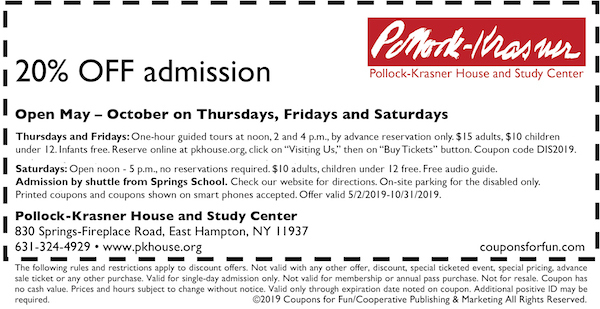 Guided tours available Thursdays and Fridays at noon, 2 and 4 pm by reservation only — call 631-324-4929 or reserve online at pkhouse.org, click "Visiting Us," then on "Buy Tickets." Enter coupon code DIS2019. Advanced reservations required only for guided tour. No reservations are required for general admission on Saturdays noon - 5 pm. Please present printed coupon or coupon shown on smart phones upon arrival. CLICK COUPON TO PRINT.